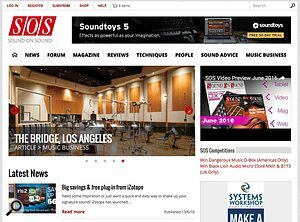 It's been a mammoth undertaking but the brand new Sound On Sound website, with a new SOS Forum, is launching today, 15 June 2016. We hope you'll enjoy exploring the modern, mobile-friendly layout and find the all-encompassing Search engine of real benefit in locating articles, news and forum posts of interest to you. Watch our videos and discuss gear and recording practices in our new SOS Forum. All forum posts have been migrated to the new software. It will take up to 24 hours for the www.soundonsound.com domain to propagate around the globe, so please bear with us while this occurs if we're offline. IMPORTANT: Existing users/members can log in at the top of any SOS page using their already-registered Email and Password. Once logged in, we urge you to visit your MY ACCOUNT preferences from the link at the top of any page, and when in the Forum check out MY CONTROL PANEL to configure forum preferences. We hope you enjoy using the new site/forum and find it of enormous benefit to your music-making and gear selection decisions.